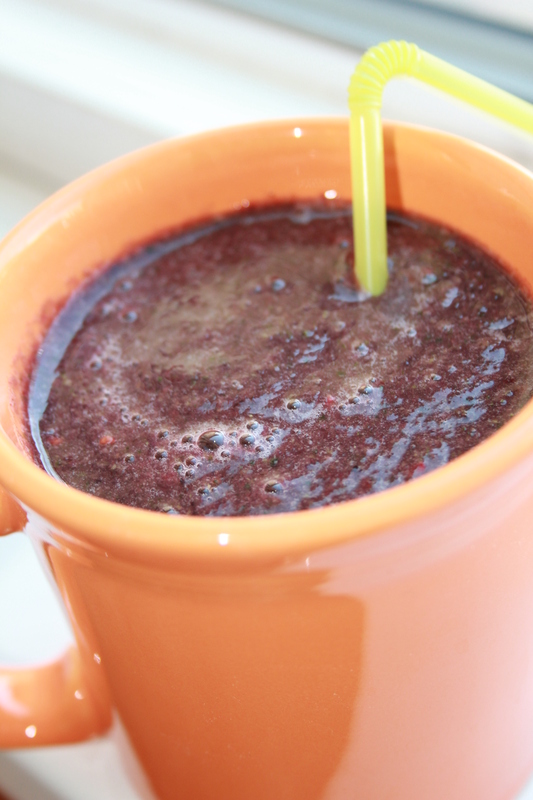 Combine water, agave and broccoli and blend until smooth. I did not have agave, but you can use sugar, or a little bit of sugar. Next add spinach until it reaches the 6 cup line (about 2 cups of spinach), and blend. 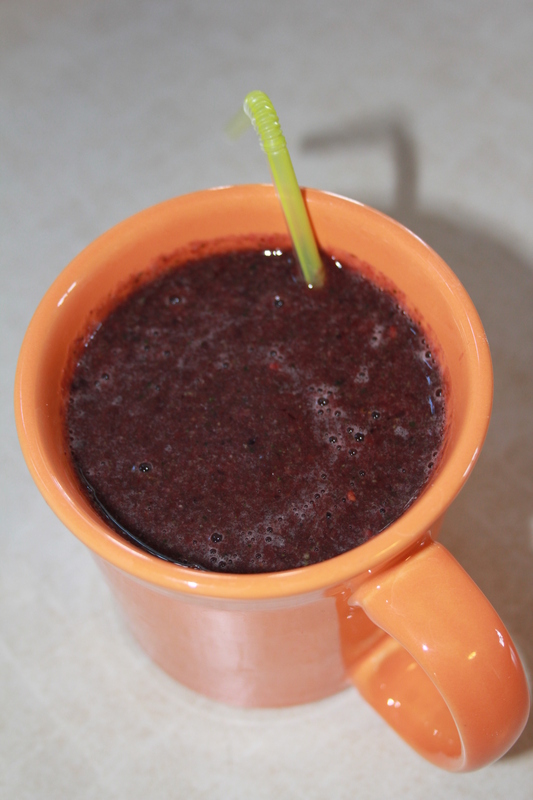 Then add oranges, pineapple, bananas, and berries. Blend until smooth. Enjoy! 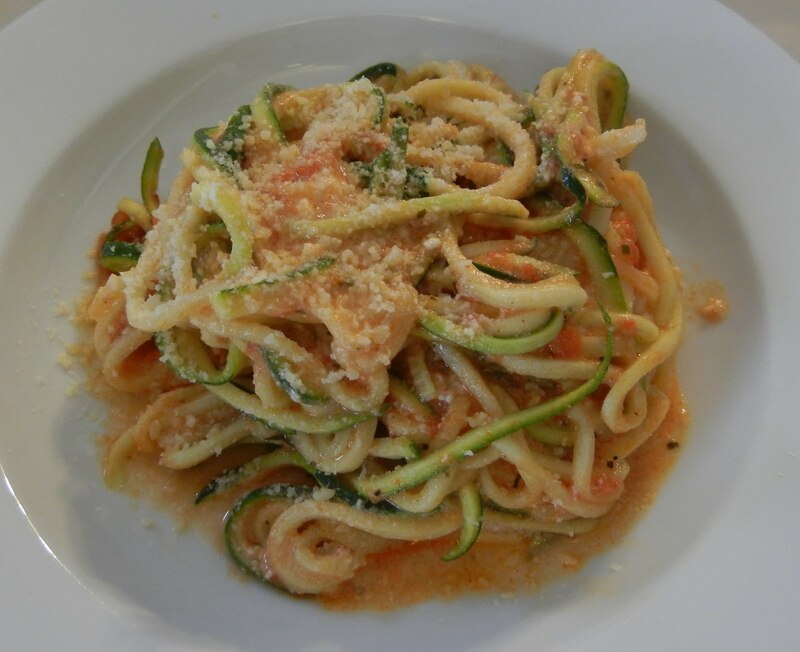 Zucchini Noodles – Get Your Kiddos to Eat More Veggies! I don’t know any mom who can get her child to eat any vegetable any time. Some are better at it than others, and mine do alright, but they still revolt when things look weird (or just because they want to). Not too long ago, I tried a recipe that had julienned zucchini in it. 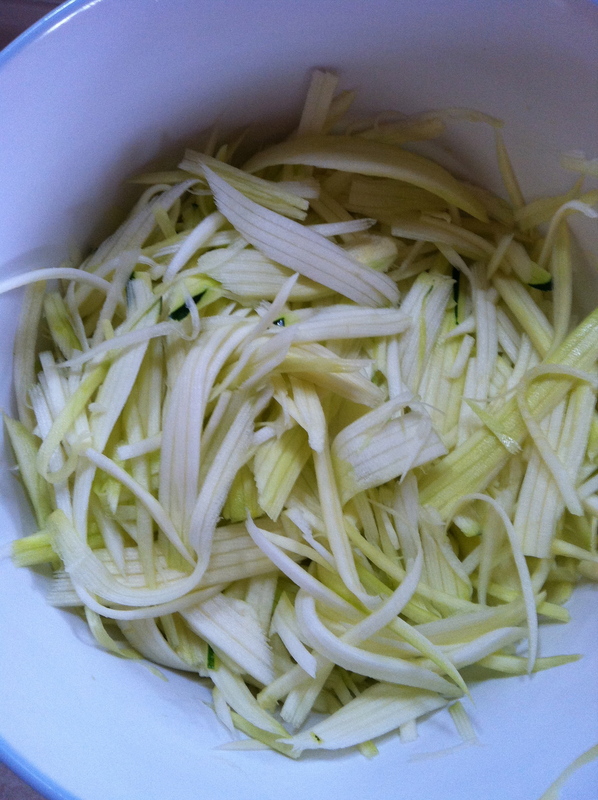 After peeling the zucchini I honestly couldn’t see it amongst all the spaghetti noodles. I wanted to try it with the kids and see what happened. 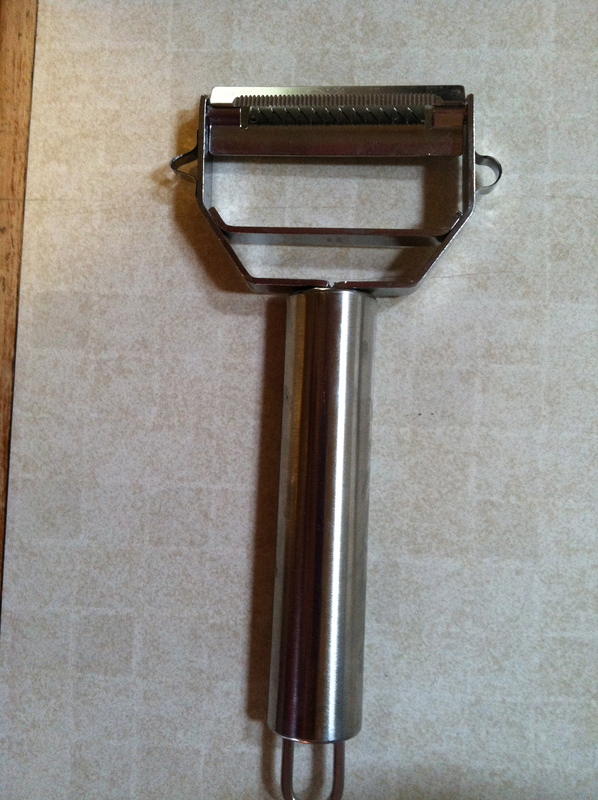 It’s called a Julienne Peeler. I borrowed it from my neighbor and let me just say, it saves A TON of time in julienne-ing veggies. 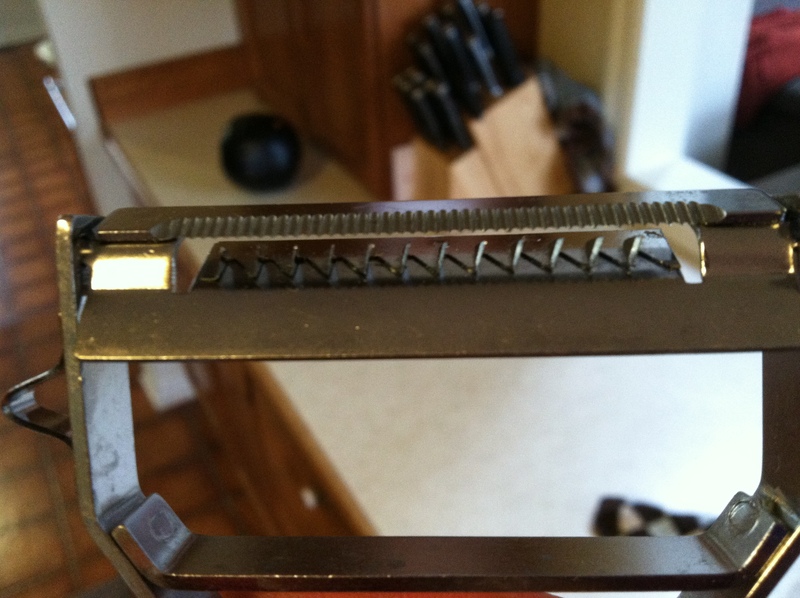 It is just like a regular peeler, except it has these little teeth in it that slices things into thin strips. So I took about 4 zucchini and peeled and sliced them (I only peeled them because I wanted to disguise them from the kids). Here’s what it looks like all sliced up. I just cooked pasta like normal and threw the zucchini in for the last 3 minutes or so. It softens up pretty fast. The sad news is that I thought I had spaghetti in the pantry and I didn’t! 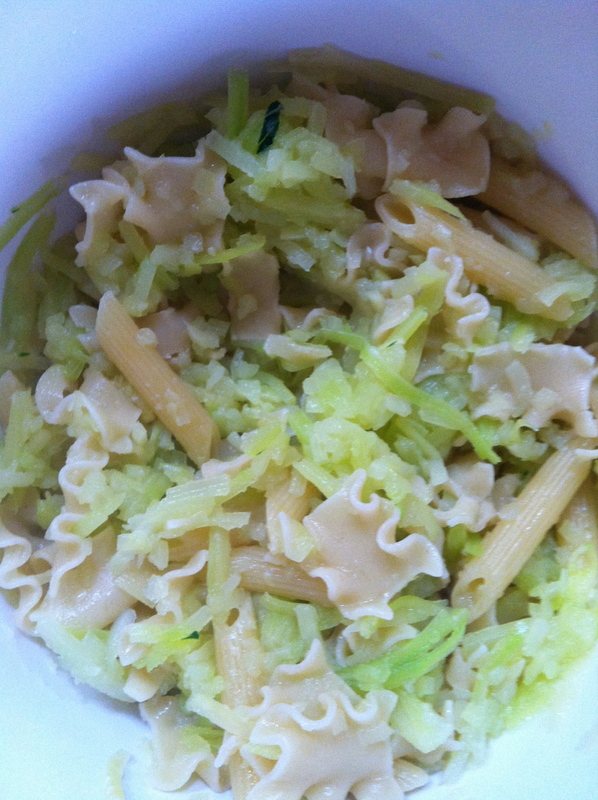 I had to use different pasta so it didn’t end up being as disguised as I would have liked, but the kids still ate it! Woop Woop!! Here’s another pic with spaghetti noodles so you can get the idea (from The World According to Egg Face). Part 1 of this book summary can be found here. A mother’s diet 12 months before conception can influence the future child’s health (!). Dr. Fuhrman includes a plan of how to introduce a baby to solid goods, stressing not to introduce it earlier than 6 months. Concerning Picky Eaters: 25% of children eat fast food french fries daily. Only permit healthy food in your home. 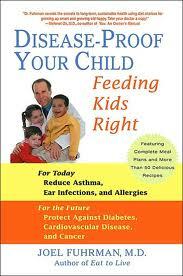 Don’t coerce children to eat. They will eat when they are hungry. Many clients come to Dr. Fuhrman with concerns that their child is too thin. His answer: they aren’t. Children are born with innate instincts on how much to eat. Some children take a while to fill in to themselves. If they are growing and thriving, they are not too thin. 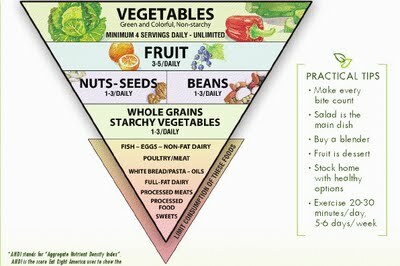 This is his recommended Food Guide Pyramid. I LOVE this. The rest of the book is filled with healthy recipes, and I am seriously considering buying it just for those alone. Loved the book, highly recommend it, and I’m definitely reading his other book, “Eat to Live”as soon as I get my hands on it! If you have young children, are planning on children soon, or are pregnant, this is an awesome read. In the early 1970’s a survey was conducted in the entire country of China, which revealed that cancer was geographically localized. In some areas, cancer rates were 100 times the rates of the lower areas (in the U.S. we see at most 2 to 3 times, so 100 times is enormous). In the USA, 15-16% of total calories comes from protein (80% of that protein is animal protein), and in rural China, only 9-10% total calories come from protein (only 10% of that is from animal sources). The Chinese are consuming an average of 2641 calories, with 14.5% fat, and Americans are consuming 1989 calories with 38% fat. The Chinese eat higher calories, less fat, less protein, less animal protein, more fiber, and more iron. Diseases of Poverty (Nutritional Inadequacy and Poor Sanitation):Pneumonia, Ulcers, Digestive Diseases, Tuberculosis, Parasitic Diseases, Rheumatic Heart Disease. Notice no cancer! One of the strongest predictors of Western Diseases (diseases of affluence) is blood cholesterol. Lower blood cholesterol levels are linked to lower rates of heart disease, cancer, and other western diseases. Many prominent heart doctors have never seen a heart disease fatality among their patients with a blood cholesterol level below 150. Nutrients from plant-based foods are associated with decreasing levels of blood cholesterol. There is a lot of confusion among scientists regarding questions with dietary fat – how much, what kind, Omega-6 or 3, what kinds of oils are okay, etc. When details are studied in isolation, results can be misleading. We need to look at how networks of chemicals behave instead. Only 2-3% of all cancers are attributed to genes. The rest are strongly influenced by diet. There is an interesting relationship with dietary fat and breast cancer. Higher fat can influence early menstruation, high cholesterol, late menopause, and higher exposure to female hormones. This can extend the reproductive life from beginning to end by 9-10 years. This extra decade of exposure to hormones can greatly influence a woman’s risk of breast cancer. A large survey in China revealed that the average age of a woman’s first period was 15-19 years old. In America, the average age is 11. The more colorful your produce, the higher antioxidant levels, which shield you from free-radicals (cancer-causing agents). Again, the benefits do not lie in an individual nutrient or mineral, but in the whole food. Don’t reach for a vitamin. Eat it in a fruit or vegetable instead. The Atkins diet reaks havoc on your system. Don’t do it. The low-carb diet craze is unfortunate. Carbs are our friends. Just make sure they are from fruits, vegetables, and whole grains. Many people think they are eating a healthy vegetarian diet by eating lots of pastas, highly processed crackers and chips, white flour, etc. This is the reason carbs have gotten a bad rap. That is the stuff that puts on weight and doesn’t add nutritional value. Chinese are more physically active than Americans. Their calorie intake is 30% higher, yet their body weight is 20% lower. They are eating the right foods (plant-based protein, fruits, vegetables, whole grains) and riding their bikes! He climbs up on the counter with his favorite stuffed animal, “silky.” I just kind of scoot it out of the way, because I know he’ll melt down if I take it away. I get out the ingredients – milk, flour, honey, sugar, eggs, salt, etc. All the while he is saying “what are you doing?” “mom, what are you doing?” “what is that?” on repeat. I help him start measuring out the wet ingredients first. I usually pour it in a measuring cup myself and then hand it to him to dump in. We start with the milk. He dumps it as I am handing him the cup, so it gets all over both of our hands. T.W.O. : “What did I do?” hysterical laughter. Before I can clean up the milk everywhere, he is shaking his hands and milk is spattering on walls, couches, countertops, and clothes. I wipe it all off. He looks at me, ignores it and sticks his hands inside again. I’m about to spout off some sort of threat or time-out warning when he sees the look on my face, jerks his hands out, picks up the cup, lifts it above his head, and drops the entire thing into the bowl. This recipe had about 2 cups of milk in it and I hadn’t put in any dry ingredients so it was very runny. It rises like a geyser and explodes on every surface within a 2 block radius. There is milk on the couch, on me, on T.W.O., all over the counter, floor, and yes, even the beloved “silky.” I stay cool. (pretty proud of myself at this point). 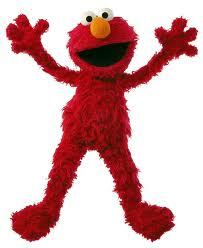 I take T.W.O. off the counter and over to the sink to wash him off. He starts jumping around begging for a soggy silky. I tell him to wait a few minutes until I can get it cleaned off. Enter theatrics. He starts wailing and sobbing that he wants silky. I turn around to rinse out the dishrag in the sink, and trip over Tornado, who has been quietly playing on the floor. I knock him to the ground and he starts bawling too. I just throw the rag in the sink and pick him up, making sure he’s not seriously injured (I mean, I’m pretty clumsy). He stops crying, but I notice he’s got a big fresh diaper just waiting to be changed, if you catch my drift. I ignore it while I finish wiping everything up. He starts whining that he is hungry so I plop him in the high chair, stinky diaper and all, and give him the leftovers from breakfast that are still on his tray. Meanwhile I wash off Silky and give them to T.W.O. who has calmed down. I decide it is peaceful enough for me to finish making the muffins, which I do. As I am reaching for the muffin tin out of the drawer, I find Tornado’s sippy cup from yesterday wedged deep inside between some pie tins. He had a mini meltdown yesterday while I scoured the house looking for it. Why I didn’t think to empty this drawer yesterday is beyond me. It is filled with milk and curdling. I throw it in the sink and stick the muffins in the oven. By this time Tornado has given himself a nice food massage and rubbed it all over his entire person, including his hair, and the rest of it he has thrown on the floor. I take him out and hose him off. I ignore the food for a second while I give hin his sippy cup. I start cleaning up a little bit when Tornado starts pouring his drink all over the floor and then slips in it and lands flat on his back just like in the cartoons. Bawling ensues. (Pep talk to myself: What is this, Amateur night? Get it together!!) I pick him up in one hand, wipe the floor with the other, then sweep up the rest of the food. I take him upstairs to change his diaper which is now making all wildlife outside pass out. I am elbow deep in poop when T.W.O. lets out a blood-curling scream and starts hysterically crying. I immediately think he has opened the oven and burned himself and I grab the baby and start running toward him. He can barely talk and finally lets out, “MOMMY, sob sob sob…( I am bracing myself for the worst – what?? Someone’s in the house??!! Are you hurt??!!) … there was an ANT on the wall!” An ant? Not a serial killer who had broken in, or a rabid animal on the loose, or a knife stuck in a limb, but an ant. Okay. Two seconds later, the timer goes off and the muffins are done. And they are not burned. And everyone is alive. That’s success in my book. 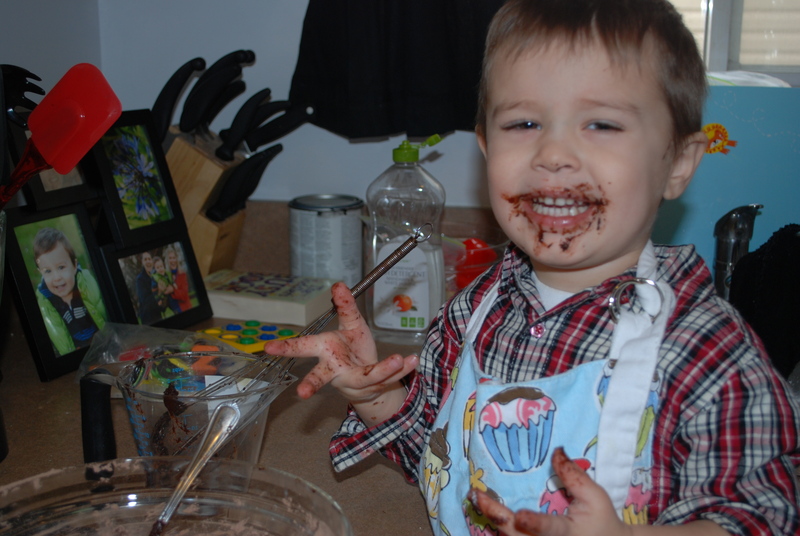 Cooking with kids. Doesn’t get much better than that.